Our Story | Ashburton's Premier Property Team. Pair up with us, we'll knock your socks off! Proud to be a locally owned and operated family business. Left to right: Tammy McDougall (nee Kenny), Phillip Kenny and Lisa Kenny. Phillip Kenny began his Real Estate career with Hanrahan Real Estate in 1987. Due to the retirement of Mr Hanrahan, Phillip purchased his business and continued working from the same address but under the new license of Phillip Kenny Real Estate Limited. 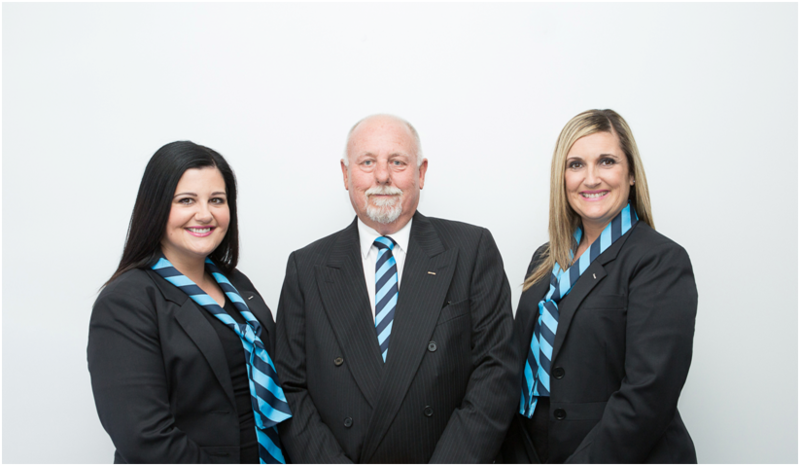 In 1989, Phillip joined the Harcourts Group, trading as Harcourts, Phillip Kenny Real Estate Limited. In 2017 Phil decided it was time to step back, and passed the ownership to his daughter Tammy McDougall and her husband Cory. Phillip’s eldest daughter Lisa Kenny started working in the business in 1995, and stays on managing the day to day running of the business while also being a successful Sales Consultant. Phillip remains in the business in a supervisory role, as well as filling in as their “sign man” when required. We are extremely fortunate to have fresh new ideas, while still retaining our traditional values and extensive Real Estate industry knowledge and experience. Harcourts Ashburton, proud to remain a truly locally owned and operated family business. Phil Kenny in the late 1980's at his first auction as Auctioneer, in Rakaia. Paul Wright, Chairman of Harcourts International at the opening of Harcourts Ashburton in 1989. Paul was doing a live radio cross at the event. The Harcourts Ashburton opening party in 1989.